“Since the day we were born, we’ve heard gunshots,” a child tells the camera near the beginning of this heartbreaking Oscar nominated documentary, which focuses on three children from the Acholi tribe living in a northern Uganda displaced person’s camp (population: 60,000) after murderous rebels from the Lord’s Resistance Army drove 90% of the tribe from their homes. Exquisitely photographed with majestic beauty that’s in stark contrast to the atrocities being relayed, at first the idea of a Mad Hot Ballroom styled documentary is off-putting yet soon we, like the three children we’re following, realize how vital it is for the arts to serve to sublimate pain and refocus the children’s energies to something positive as opposed to feeling defeated or orphaned by the unspeakable acts perpetrated on them in the past and dangers of living in the “most remote and vulnerable” northern Uganda camp. Refreshingly, the film opted to let the children, including thirteen year old orphaned Rose, fourteen year old Nancy who looks after her three younger siblings, and fourteen year old talented xylophone playing Dominic document their own experiences straight to the Fines’s camera in lieu of a narrator. However, some critics cried foul at the “uneasy sense of being manipulated” (Stephen Holden, New York Times) by both the “children’s controlled, likely coached interviews,” (Rachel Howard, San Francisco Chronicle) and as Holden noted one devastating scene in particular that he felt seemed rehearsed, and while there’s no doubt that the children probably did go over their tales a few times with the filmmakers, it doesn’t make their words any less heartrending or true. 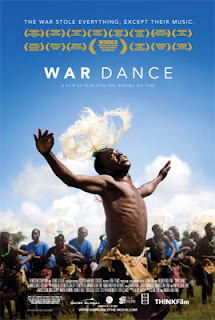 Rated PG-13, THINKFilm’s War Dance seems like a terrific choice for eighth grade and above classrooms due to its timeliness and accessibility in getting the message across to viewers of all ages with an unusually uplifting storytelling arc, yet at the same time opening the eyes of young viewers to events happening around the globe.